I should Email my consulting doc but NO EMAIL. I need to research Scott pigeon guns. No Email needed there, but how can I ask questions of my expert friends? Must get new book reviewed in WSJ about the computer – distracted, The Organized Mind. *I say “talk”. I may mean phone, for those I can talk to on my partly- blocked ancient unlisted landline ( same since I moved here 30- some years ago). But I mostly mean Email, a Godsend for someone who writes at letter length. And for the young, or at least the smartphone savvy, a few facts. My left ear is not quite stone deaf, but effectively does not work in the bar or phone. I am supposed to “swipe” the phone to answer. I CAN’T. I swipe away, and the phone remains unmoved. Similarly, I can’t make it call. Fingers not brains. I use a mouse with my state- of -the- art Macbook Air. Lib wouldn’t believe my inability to double click on the touchpad until she watched. Similarly, I cannot make the phone work by touching it. And that is if I don’t DROP the frackin thing. Call the landline. I repeat, Parkinson’s, not senile dementia. Yes, I can shoot, a trigger being more definite than a touchpad. But if you want to talk, better knock on the door, call the one with wires, or wait out my server. For entertainment meanwhile, next cover, by Vadim for Edge. It IS an edge of the wild– a Gos taking a hooded crow, with his Moscow apartment building in the background. they approach it, like Daniel’s 1870’s Purdey. For my amazement, and because they cross and tie together several of my and I hope your fascinations, I will also present things like Holland’s faux Japonaise Water gun, the only gun with gold inlays I ever really liked, or Malcolm Appleby’s early guns for McKay Brown, one of which, a feathered Raven, was donated to the Tower of London. He calls such things “totems”. When we were there it was in a dark room in a cramped dark space about two feet off the floor, with none of the associated material that even I have. Despite the “woo” factor, I am less interested in the all- baroque over- the- top creations by England’s and Vienna’s bespoke makers who once made guns for the maharajahs of the princely states of India, and now design for Gulf princes, Texan oilfield fortunes smoothed by money, and, at the moment, Russian oligarchs. (Though China is up and coming, recent investigations of provincials who own twenty- plus houses bodes dubiously for them, especially since as far as I know China still virtually bans all firearms more “technological” than matchlocks, which hunters still use in Tibet with the local tazis). For an example, look for the one with animal skin textures, zebra and worse. Though if it is true that the owner hunts actual game with it in the Arctic and Central Asia, a “Flint’s Rules” toast and happy escalation: Nos’drovya! I do still fewer modern– postwar?– production guns, unless in hunting tales. But because ergonomics, form and function, all work harmoniously together, I realized once again, while photographing my vintage Smith and Wesson revolvers, that they are artful constructions too. No one could have done the amount of handwork they required back in the day without having an aesthetic sense (the blue .22 is almost as old as I am and has a barrel of odd length; the stainless .38 “J frame” is newer but not new). Of course the figured walnut custom grips by Herrett help. They make them to a tracing of your hand, and it takes a few months, but it is worth it. The Green Junglefowl and the Nicobar pigeon resemble chickens and pigeons but pushed to fever- dream intensity. The mere existence of such creatures is at least a partial antidote to the blues. My first Tazi, Lashyn, the “jealous girlfriend” from Kiev, died yesterday on the couch in our living room where she bore two litters of pups. She had battled diabetes and cataracts for two years, but could not win over cancer. The first, her last photo, was taken last week. Update: the comment by Chas below made me look, and Lashyn’s Journey is still up on the Naturalist site in Ukraine. As he says, it seems like yesterday. 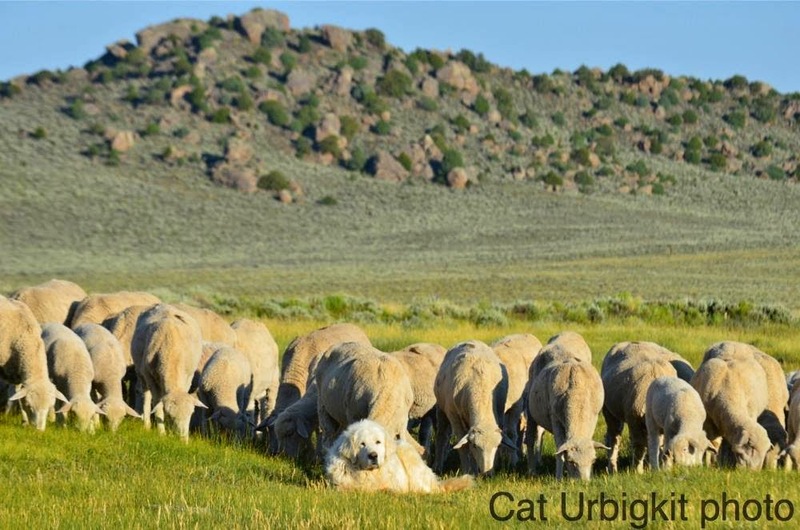 We moved our sheep flock to grazing range along the foothills of the Wind River Mountains in early July. We’ve had a refreshingly moist summer, bringing this arid rangeland to life. The ewes are fat, the lambs are growing, and we share the same piece of earth with abundant sage grouse, as well as nesting long-billed curlews. 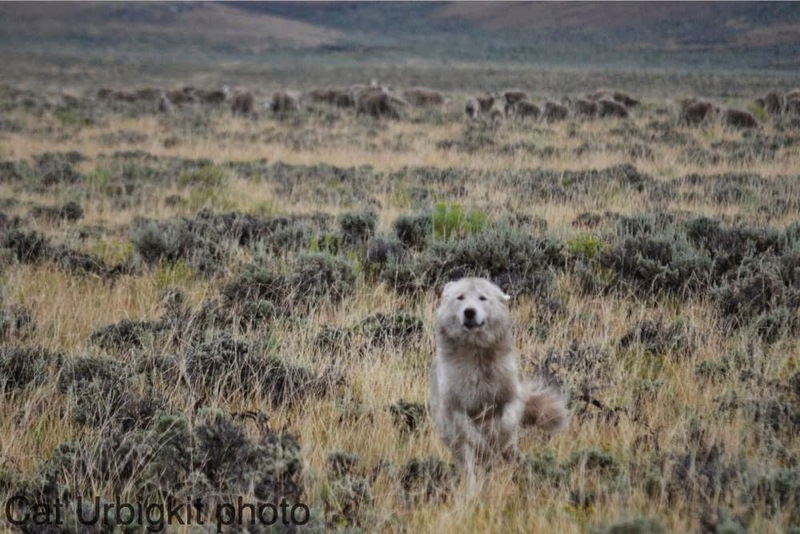 Nine-month old Beyza (an Akbash) has claimed the range as her own, and is a fantastic guardian – as are the others in her lineage, including her mother Luv’s Girl, and sister Rena. When we moved onto the range, my friend Pete asked if I would take care of an extra female livestock guardian dog. She had just given birth to five pups, and the pups were too small to travel with the herd as they moved into the mountains. I tended to the small family for a few weeks, but one of the 7-week old pups started trying to follow my herd as it grazed during the day. After retrieving the pup from more than a mile away from its siblings, we sent the female to the mountain, and brought the pups to our home, where we have a scattering of orphan lambs and adult sheep. 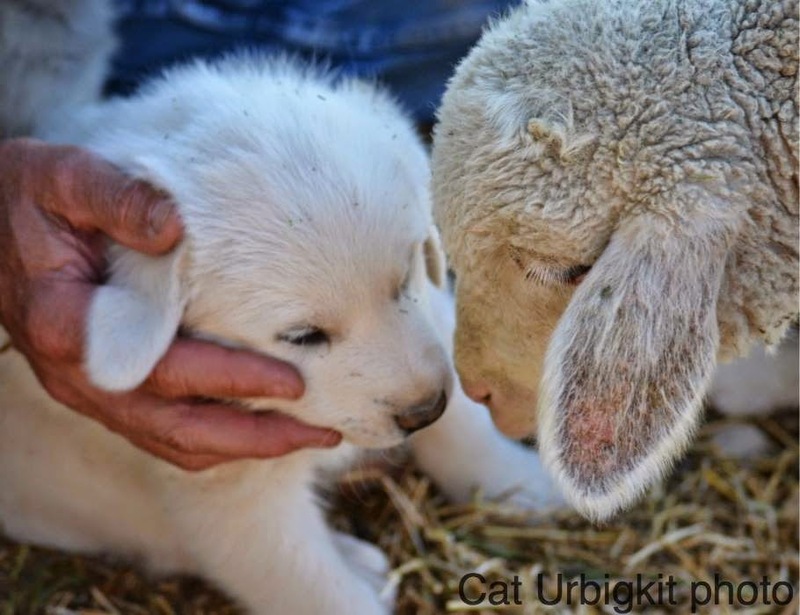 When people talk about getting livestock guardian dogs off to a good start, much emphasis rests on getting pups introduced to the species it will guard at a young age. That’s important – bonding is best if if starts early. The introductions to the lambs went well. But what doesn’t get much discussion is how much easier it is to bond pups to a sheep herd that has had a long association with guardian dogs. It’s nearly a cultural thing – this relationship is so close, continuing from one generation to the next. 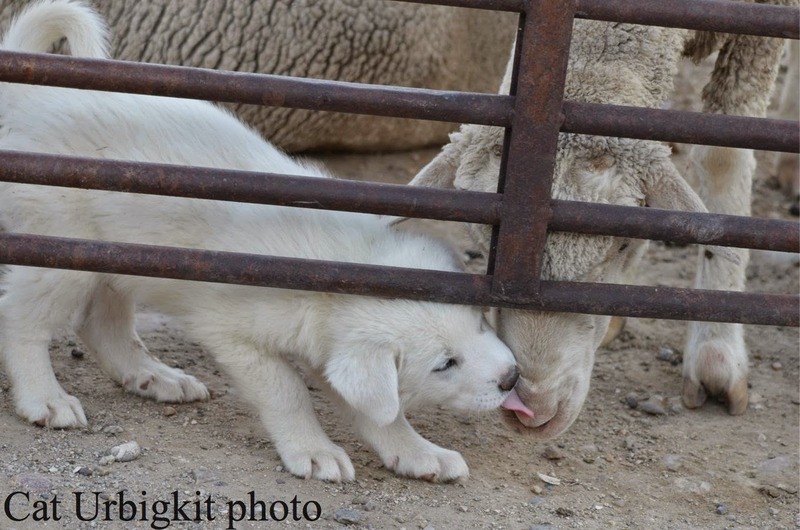 When new pups arrive on our ranch, the adult sheep come to investigate. When the pups walk underneath the ewes, and sniff the underbelly of the rams, the sheep are not panicked or upset. They don’t stomp the pups, and show an amazing amount of patience as pups chew on the big curls of a ram’s horn, or investigate a milk bag on a ewe. The new pups were soon crawling under the yard gate to hang out with the adult sheep, especially a big range ram. We select and cull sheep based on not just performance and appearance, but behavior. Calm and attentive behavior is ideal. This ram is an ideal babysitter for the pups, and gently disciplines bad behavior. “I actually made an effort with the USFWS (then with pretty good insider connection in a friend in a high place to get the Lanidae included in the list of birds legal for falconry when they were first discussing opening up most of the hawks, falcons and owls. We were not successful because it would have required an act of congress, literally. “But they certainly are suitable for falconry and as I learned in my research they were indeed working members of several countries’ royal mews. “We have two species in the US (Loggerhead down here and the larger Northern in the upper parts of the US). Both are voracious and regular eaters of birds. No less an observer than Harry McElroy says that in his area, the wild shrike is the preeminent, long-distance pursuit hunter of passerines; and this is a guy who specializes in flying Aplomados! “I conducted an informal but pretty serious shrike breeding survey when I moved to Baton Rouge and kept at it for about 5 years. I counted and watched dozens of pairs raise and fledge young. Most pairs caught and ate birds, some as large as cardinals, in addition to mice, rats, insects and lizards. The young once fledged were particularly bold and would regularly pound into ground-feeding mourning doves and meadowlarks, although I never saw one subdue a bird that large; clearly they were game to try. “Given the timing of the breeding season here, which coincides with the return of migrant warblers, it is not usual to see little yellow-feathered carcasses on barbed wire in late Feb and March around nesting sites. Below, Turkestan Shrike (Lanius phoenicuroides I think) in Kazakhstan, by Andrey Kovalenko, dog- in- law, ace photographer, and ornithologist.